The primary goal of The Master Course in High-End Blocking and Staging is to do the most effective blocking with the highest production-value, and to build a vast repertoire of techniques to make Directing more expressive — and ultimately more fun. Models are not just the most patient actors, there’s a very particular reason The Master Course uses them: They are completely expressionless. As we work with dynamics between the characters and blocking camera moves, all emotions must be coming from the camera work. Working with models is incredibly educational, because the effect of every technique becomes so clear. As soon as we separate the acting performance from the camera work, we get a much deeper understanding of how the camera work infers thoughts and feelings. Blocking is just as important for a Cinematographer as it is for a Director, sometimes even more so. On an ideal production, it’s not either the Director or the Cinematographer who makes blocking choices, but an intimate collaboration. When both have great blocking skills, the process becomes much more non-verbal, intuitive, and creative. Directing is a full-time job, and some Directors want to dedicate their attention to developing and nurturing the actors’ performances, which is a worthy goal, and is almost always better for the actors. When that’s the case, he or she depends on the Cinematographer to develop the entire camera-plot, and pick the angles and moves that best bring out the emotions in the scene. As essentially the Director’s right hand with regard to blocking, it’s important for a Script Supervisor to have a deep understanding of camera work. A Script Supervisor often has a higher vantage point, and is in a unique position to spot errors when shooting. There’s nothing more reassuring to a Director than to know that a person with equal blocking skills is keeping an eye on the bigger picture. With great blocking skills, a Script Supervisor becomes a trusted – and much needed – ally in working out scenes. While Editing often happens long after the fact, Blocking and Editing are so interwoven that one really can’t function without the other, and the course deals quite a bit with it. It’s in Editing that it becomes clear which shots are needed, and an Editor with deep knowledge of blocking is uniquely disposed for making shot suggestions. The filmmaking skills required for producing high-end cinematic or 3D sequences are no different from the skills required by an experienced Director. While it’s possible to create any conceivable camera move in 3D, great sequences come from good old-fashioned Directing, which is really independent of whether the medium is live-action or animated. (Quick Tip: The fastest way to give 3D camera work a movie-feel is to rig a virtual dolly/crane in 3D and operate within the same constraints as “physical” filmmaking. Whether on a small or a large budget, the key to excellent Videography is production-value. But production-value has very little to do with what something has actually cost to shoot, and everything to do with how shots are designed. It is what makes the difference between a million-dollar production that looks cheap, and a low-cost production that looks ten times its budget. 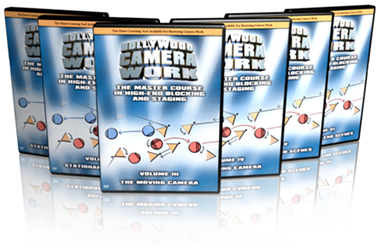 While the course is mainly geared towards narrative shooting, the first four volumes are all about building a comprehensive language of camera moves that apply equally well to any type of shooting. The underlying focus throughout the course is on creating the most elegant and classy shots. Especially Volume III and IV deal exclusively with many hundreds of dolly and crane techniques that will dramatically increase the production-value of your next shoot. It’s not uncommon for Actors to feel creatively restricted by meticulous camera work and having to hit marks to the millimeter. But the truth is that good camera work can bring a depth to the character that is simply impossible to achieve by the performance alone. A deep understanding of camera work allows an Actor to really know what is being communicated, and take control of his or her performance in a whole new way. A script is a blueprint for a movie, and a Writer with blocking skills is able to create writing that translates seamlessly into camera work without necessarily cluttering the script with stage directions. Writing that’s done with blocking in mind is very easy to Direct – or hard to Direct wrong – and ensures that more of your vision ends up on screen.